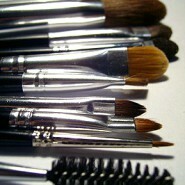 Brushes are the most essential tools in any makeup kit. Not only are they a way to apply makeup, they are an extension of an artist’s arm. There are plenty of fantastic brushes on the market which comes in a variety of shapes and sizes. Regardless of the price, the brand, the handle length, or even the type of hair, the brush itself is not as important as how you use it. Foundation Brushes: This group includes the standard liquid/cream foundation brush (which resembles a painting brush), and the flat topped or domed kabuki brush (usually short handled and fluffy). These two often seem like mono-taskers because of their large size, but they make a great alternative to fingers for applying moisturizers and masks, which is very spa like and a more sanitary way to apply on others. Also their large surface areas are great for bringing makeup onto the body. Powder Brushes: This group includes the large, paddle style brushes, blush brushes, highlighter brushes, and contour brushes. These brushes do a great job of distributing powder evenly on the face, but it is not necessary to own them all because they are often interchangeable. The trick to picking the right brush for you is to pick ones that match the size and scale of your face. For those with small cheekbones, use a small brush to avoid applying too much blush, and visa versa. A good rule of thumb is to stick with brushes that are a little smaller than you may think you need. They are easier to control and it is much simpler to build up makeup, than it is to take it away. Eye Brushes: They include everything from the standard, packing brush to domed, fluffy, blending, crease, highlight, flat, eyeliner, and smudge varieties. They can get overwhelming, but a good rule to follow is that the flatter the brush, the better it will be at packing on color, and the fluffier the brush, the better it will be at blending. It is also important to consider your eye shape and size before making a purchase. Aside from working on the eyes, these brushes are great at precision contouring down the nose and for subtle applications of contour and highlighter. In fact some eyeshadow brushes work great on the lip to make fussy, matte lipsticks glide on like butter. Lip Brushes: These brushes are often very small, flat, and synthetic, meaning that they aren’t made from animal hair. Synthetic hair brushes usually stand up well to wet products and strong pigments, whereas natural hair brushes tend to play better with powders. Apart from lips, lip brushes are fantastic for very fine detailed highlighting on the cupid’s bow and on the inner corner of the eyes. Also, they make some of the best eyeliner brushes on the market. You see, brushes are pretty simple. Remember, choose ones that suit the size and shape of your face and don’t be afraid to multitask. Get out there and experiment with your brushes and if you find a new way to use them, be sure to share it with me.